excellent location. Room are very comfortable and clean. Fully equipped kitchen and they have a swimming pool with a little beach!!!! We loved our stay here. The best location for park & beach, great facilities and the cleanest/best stocked kitchen we’ve come across on our travels. The staff were friendly and helpful and would definitely recommend staying here. Only thing I would say is there is only one dorm so a lot of families/older crowd so maybe not ideal for solo travelers. I loved my stay here! I didn’t like how the dorm doors don’t lock and they get hot during the day since there is no a/c and not really any windows to open. But didn’t plan on staying in there during the day anyways! Gia with reception is one of the greatest, most helpful people I have ever met, she offered to help me and consumed a good amount of time doing so. 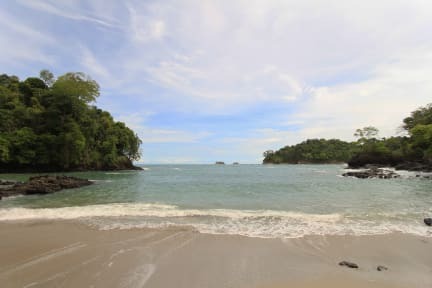 It is located literally right outside manuel Antonio park and just a couple minutes walk from the beach. 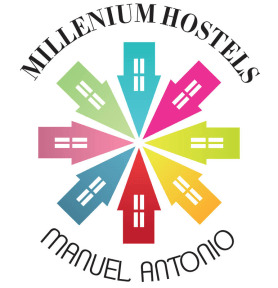 Staying at Millennium Hostels was a great experience. The hostel is located just outside Manual Antonio National Park so you can easily get a head start on the line up that can form to get into the park. The hostel is also just a short walk to the beach. The owners of the Hostel, George and Geo were amazing! Very helpful answering all of our questions and informing us on the best activities around Manuel Antonio and how much they should cost. Hostel has a very chill, clean, and quiet vibe. The hostel is in a great location, a 5 minute walk to the beach and right next to the National Park entrance. The staff were friendly and helpful. It was nice to have a privacy curtain and they provide a towel that you can switch daily. Everything is clean and it’s nice to just hang out by the pool in the afternoon. The only suggestion I would have is that they make sure they have lockers for each bed- I had to share a locker with a friend I was traveling with. Really happy that we decided to stayed here, we really enjoyed the hostel.The staff is excellent. The dorm bathroom is very small. Too small to get dressed and ready in. Also, I didn’t like that there was no lock on the main dorm door. During the day the main gate to the hostel would stay open, so cars could get in and out, so this made no lock on the dorm door even worse. The beds were comfy though and everyone gets their own light, outlet and curtain which was great. Staff should not concentrate on selling tours, just giving good directions and suggestions. Reception was crowded sometimes. Facilities are good and location is the best.